Houston is the fourth largest city in the country and as such, plays host to an exciting schedule of events. From rodeos, concerts, fairs and festivals to new construction projects for the growing community, people are drawn to the lively offerings of this expansive city. To maintain its reputation for being a fun and beautiful place to visit and live in, Houston businesses, event venues, and construction companies entrust their sanitary requirements to Texas Waste Co. We’ve been keeping community gatherings, private parties, and business or construction projects up to sanitation code since 1999 with the cleanest and most dependable Houston Porta Potty Rentals and portable hand washing station rentals in town. At Texas Waste Co., we privately own and clean all sanitary stations and porta potty rentals to guarantee perfection. Because of our long-standing reputation for quality sanitation, porta potty brokers also choose our services because they know we will deliver on our promises. With simple price structures and same-day distribution, Houston businesses and event coordinators know exactly what they’re getting when they call Texas Waste Co. We’ve got the highest quality portable toilets, luxury trailers, hand wash stations and sewage tanks to meet the requirements of any size and class event. Equipped with the latest on-boarding service technology and a knowledgeable staff, we can help pair your next event or project with the exact number and type of portable toilet rentals and hand sanitizing stations you’ll need for success. Brothers Augustus and John Allen founded Houston in 1836 near the Buffalo Bayou. Today, it is the fourth most populated city in the nation and home to 23 Fortune 500 company headquarters. Recognized by Forbes Magazine as among the 10 best cities for young entrepreneurs to live in, the community is diverse, thriving, and scenic. Houston is often selected as the setting for movies like: Armageddon, Apollo 13, Terms of Endearment, Tin Cup, and more. For incredible service and pricing on portable toilets, hand wash stations and restroom trailers in Houston, Texas Waste Co. has you covered. 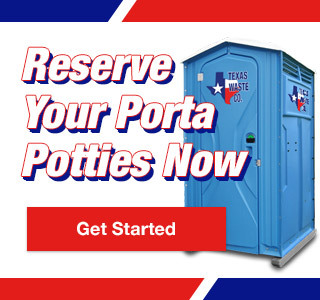 Call today to speak with a Houston porta potty specialist!